Worcestershire completed their season with a nine-wicket win over Derbyshire to secure third place in Division Two. After Wayne Madsen had hit exactly 100, his sixth Championship ton of the summer, first-innings centurion Harvey Hosein got to 59 to take his total of runs in the match to 167 at New Road. But the visitors lost their last five wickets for 11 runs to collapse to 266. Worcestershire then took 9.4 overs to reach their target on 40-1 - their third Championship win in four matches. After resuming on 15-1, Madsen and Hosein looked to have taken the prospect of victory out of Worcestershire's reach with a fifth-wicket stand of 124, before Hosein's 57-run stand with Tom Milnes (36). But home skipper Daryl Mitchell put himself on and took two wickets in successive overs to get rid of Milnes and debutant Greg Cork. Spinner Brett D'Oliveira then removed Hosein and Will Davis in the space of two deliveries before Miguel Cummins had Tony Palladino leg before. 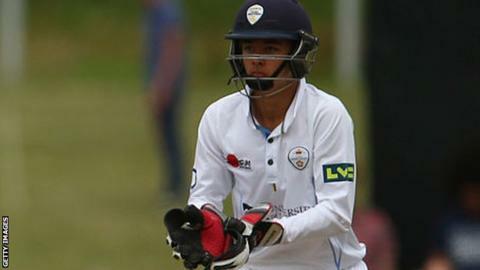 Derbyshire, who have finished bottom of the Championship for a record 16th time, finished the season without a single win for the first time in 92 years. Wayne Madsen finished the season with a personal-best total of 1,292 runs, the fourth year in a row that he has got his 1,000 first-class runs. The last Derbyshire player to score six hundreds in a Championship season was Chris Rogers in 2009. "A lot of the crowd went home because they anticipated the game fizzling out. "At tea five wickets sounds a lot to get but we lost five for five at Hove. We reminded the players of that at tea because they were pretty tired after two days out there in the field. "You can never predict what happens in cricket but Daryl Mitchell came on, got a couple of wickets and we finished them off. It was nice to end with another win." "The guys battled very hard. Harvey Hosein and Wayne Madsen played magnificently again but the top order were not able to take enough time out of the game in the second innings. "It's obviously been a new-ball wicket. It's been the pattern of the game. Most games of cricket are. That's why myself and the top three bat in the position that we do. "But we weren't able to bat as long as we would have liked was because the top order didn't bat for long enough."